Mosaic constructed this elegant landscape on a challenging, sloping, rocky site in Salem, Oregon. The original landscape's meandering lines and meager plantings felt out of balance with their surroundings. Our clients hoped for a garden that fit the look of the neighborhood and their older home, while reflecting their somewhat more contemporary aesthetic and desire for an intimate, serene outdoor space. Mosaic designed an ample flagstone path and rectangular lawn, surrounded by deep planting beds, to make a space that is at once welcoming and enclosed. Several Japanese maples and layers of beautiful foliage make this an exceptional four-season garden, beautiful even in winter. Before we built the garden, our clients rarely spent time in the front yard and even felt exposed to the street from within their house. 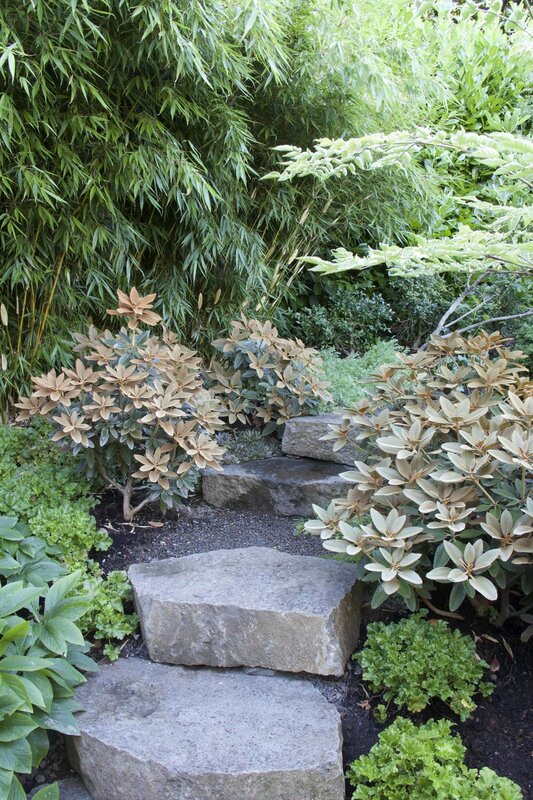 Now, they walk through and sit in the garden often, especially enjoying the basalt stone stairway through lush, shady plantings and the meditation bench, nestled on the east facing hillside. The once neglected tiny back yard is now a private outdoor living space, with an ipe deck and lush shade plantings. Text and photographs copyright 2002-2016 Mosaic Gardens, all rights reserved.